Change is constant in life and perhaps nowhere is this more evident than in health care with the implementation of the ACA. Read how social services will need to adjust to the technological and business shifts this legislation will bring. While we've already heard a lot about changes to hospitals and health networks, the signing of the Affordable Care Act (ACA) stands to have a significant business and technological impact on the field of social work as well. The implementation of electronic health records is already taking place within health care and most believe those requirements will trickle down to the social services sector in the near future. That means social workers must become increasingly adept at utilizing technology and implementing software. In addition, there is no doubt that the ACA will institute changes to the way that social workers do business. Those already in the field must be prepared to adapt to changes in both business and technology, while those responsible for education should consider pertinent changes to training. The government has already demonstrated that it recognizes the value that social workers bring to the table as the ACA finds its foothold. Last September the White House held a briefing for social workers that focused on the importance of their role as the ACA moves forward. Many believe the event, which was led by Darla Spence Coffey, PhD, MSW, president of the Council on Social Work Education, was one of the first times the role of the social worker was truly recognized for its contributions to the health care field as well as the possibilities it holds within this new model. But the key to success has a lot to do with how the field will handle these business and technological changes. "The door is open," Coffey said. "But we, as a profession, now need to make sure we continue to communicate our value as we bring the goals of universal health care coverage to fruition." Many share the sentiment of continuing the journey forward and believe social workers can have a great impact on the success of the ACA. But there is room for growth when it comes to technology. "The social services have always lagged behind when it comes to the pace of technological change and that's never been a problem," says Mike Meikle, CEO of the Hawkthorne Group and an IT consultant with experience in the human services sector. "There hasn't been a requirement to keep up with technology as the social services have always been more of a face-to-face field." But Meikle says that the ACA stands to change that. While social workers will still retain that core face-to-face client time, the field can expect to be faced with a requirement to maintain medical records and patient data electronically. "As health care is being pushed in that direction with electronic health records, access to health information exchanges, and other electronic communication, those requirements are going to trickle down to the social services space. If you're going to be integrating with the health care space and if you have a system that hasn't been upgraded in 20 years, you are going to have some problems." All of this also equates to the field developing a greater understanding of available software packages as well as how to use them, Meikle says. For those unaccustomed to using software, this can feel like an overwhelming task. "One of the first steps that social services offices can take is to look around at what their peers are already utilizing," Meikle says. "Find a group that has already implemented a software package to manage their client base and be prepared to ask a lot of questions. If you plan to integrate in any way with the health care space, a greater understanding of utilizing technology to manage the practice is a must. Large health care systems and hospitals simply aren't going to want to connect with practices that are out of date and can't offer their patients the same level of connectivity or service that they're already providing." In addition to adapting to software and systems changes, social workers can also expect that this new direction will push them toward other uses of technology. As the client base expands and more individuals have health care coverage or require assistance with it, social workers may need to be adept at other forms of electronic communication, adds Michael Reisch, PhD, MSW, Daniel Thurz Distinguished Professor of Social Justice at the University of Maryland School of Social Work. "In order to be able to communicate more effectively with a diverse array of clients, constituents, and collaborating organizations, social workers will need to be comfortable using social media such as Facebook, Instagram, and Twitter." And as more hospitals and health networks begin to look at and utilize telehealth practices, these technology-based services may also trickle down to the social services sector, suggests Meikle. The field of health care is already finding that at-risk populations have a lot to gain from telehealth, which is defined as the use of electronic information and telecommunications technologies to support long-distance clinical health care, patient and professional health-related education, public health, and health administration. Through video imaging and communication, those in rural areas can now gain access to more specialized medical care that their community hospitals might not offer. "I do believe that social services will also be pushed in this direction," Meikle says. "After all, they're the ones typically working with the at-risk population groups. Being able to communicate with clients who can't travel the many miles to see you in person is only going to be an increasing need as the ACA comes into play. People are already looking to use technology to monitor their health. Social services is going to keep bumping into that until they finally get on board. It's just the way things are going." While the many technological changes that the ACA stands to have on the field may seem jarring, the changes to the way business is done will likely be more adaptable. Going forward, it's believed that there will be a greater connection between the medical field and the social services sector as the ACA promotes a model of community-based care. While the current health care model tends to separate physical health from mental and behavioral health, this new model aims to bring them all together. "Health has both a physical and mental component, as well as extenuating environmental factors, and social work has an impact on all of that," says James Herbert Williams, PhD, MSW, dean of the Graduate School of Social Work at the University of Denver and past president of the National Association of Deans and Directors of Schools of Social Work. "That gives social workers the opportunity for an integral role within the medical profession." In general, social workers are already a natural fit in the medical community. "A social worker is a great person to have around when someone has been diagnosed with a new condition," says Williams. "There are a lot of parts of the process that come after that diagnosis—even helping the patient understand the diagnosis—and social workers can excel at putting those pieces together and navigating the road ahead." Social workers can also expect to put their teamwork skills to increasing use in this new model. "Since the ACA also emphasizes an interdisciplinary approach I foresee social workers not only working with hospitals but joining efforts with churches, community groups, and local employers," says Reisch. "Social workers have skills that make them incredibly useful in an integrative health care model. This idea of a one-stop-shop kind of model where physical, mental, and behavioral health are all provided are a great frontline opportunity for social workers. The idea is to get more conditions identified early before they become serious." Although working side by side with the medical community may feel new to many, Reisch says it's really not. "A century ago, social work and public health were like twin sisters," Reisch says. "They've worked closely together before and it can be done again. They are philosophically compatible. And as the ACA encourages greater involvement of social workers in the health care system, I think we'll see social workers finding more roles not only in traditional places such as hospitals but even broader than that as well." In addition to learning new technologies and adapting to practice-related changes that come with this new health care model, a third area of change will come as social workers assume the role of "patient navigator." This is probably the easiest change to adapt to; it's something social workers are already accustomed to doing. 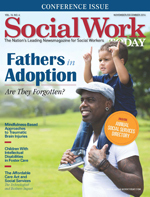 "Social workers can provide patients support as they help them to navigate the system," says Salome Raheim, PhD, ACSW, dean and a professor at the University of Connecticut School of Social Work. "This is something we've already been doing as social workers but the importance of patient navigation has really been elevated with the implementation of the ACA. Social workers can help educate patients and make them aware of what health plans exist as well as assist them with information on how to enroll in those plans." It's certainly not a new skill set, agrees Williams. "We've already done this," he says. "Helping people navigate systems is what we do. We've served as a guide, helping people navigate the welfare system, or worked with elders to navigate Medicare or Social Security. Advocating and educating is an essential part of who we are and it will be not different with the ACA." The only thing that will be different is the system being navigated, adds Raheim. That's why it's so important that social workers make an effort to stay up-to-date on the latest information. "The key is that we educate ourselves," she says. "Social workers must be educated on the ACA whether we're working directly in health care or not." Even if social workers are not directly employed in the health care field, it's likely that the populations they serve will be affected in some way by the ACA. Even helping patients navigate the process of becoming insured can be incredibly useful, particularly for those who never had coverage before. Social workers should expect to be able to assist with helping people sign up for care, understanding eligibility requirements, detailing what programs are available, assisting with Medicaid, or directing individuals to the health insurance exchanges. Patients may also need assistance navigating "patient portals," which are increasingly implemented by health care groups since the adoption of the ACA. A patient portal is defined as a secure online website that gives patients convenient, 24-hour access to personal health information from anywhere with an Internet connection. This, of course, comes back to the technology issue. "Besides considering the implementation of a patient portal system for their own practice, at the very least, those in the social services field should know how to operate these systems if their clients are already using them," Meikle says. As developments in the health care system create new opportunities and potential for changes in the field of social work, it only makes sense that they be addressed in a school setting. The way in which social workers are trained as well as some of the education provided in the core curriculum should be considered. With the integration of the ACA, technological skills are a must and there is great opportunity to incorporate more of this training for social workers at the educational level. While social workers may not directly be operating these systems it is likely that greater integration of behavioral and mental health services with health care in general will ultimately link the fields electronically. At the very least, social workers may be required to have a basic understanding of how these software systems work. There is also academic opportunity to discuss the implications of expanding technology use. "The increased use of computer technology will not only require new skills and the modification of familiar skills, it will also create new potential ethical dilemmas around such issues as confidentiality, informed consent, and the intersection of professional ethics and the law," says Reisch. Going forward, education will play a key role not only for students but for current social workers, adds Meikle. As the ACA brings technological change, new training may be required. "New business and technological processes are to be expected," Meikle says. "Technology will make inroads into the social services space. The question is how to integrate them into business practices. That's where training is going to be important." And even though social workers already bring many of the practice skills needed to work in this new system, there's still room for education there as well. "We absolutely need to rethink the training of social workers so that they can work in an integrative health care team," says Raheim. "While social workers have always been team players, this new model of integration is still a big change. We are now talking about a total care continuum in which behavioral and physical health are integrated. Do social workers have the knowledge to work in that setting? Some may, but more training can be done to better prepare social workers for this new environment." Marvin J. Southard, DSW, the director of the Los Angeles County Department of Mental Health, agrees. "Right now the biggest problem the U.S. health system faces is the integration of primary care with specialty care," he says. "Our profession is well-suited to figure out how care coordination ought to take place but that requires us to deepen our skills of being effective in multiple systems." Even social workers who at their core are skilled in team-building have gotten used to working in a system where specialties are compartmentalized, says Southard. And even within the behavioral and mental health services areas (which are undoubtedly linked) the subsets have been quite separate. But social workers must be willing to step outside of the lines. "I know that most mental health social workers historically stick to mental health and don't know much about substance abuse treatment," Southard says. "But they go hand in hand. It has to be a core skill. Those in mental health must at least know the beginning treatment steps toward helping those with addiction issues." As the field begins to work more closely with health care, social workers must also become more comfortable with medicine. "Social workers should have enough basic knowledge to be able to talk about testing for diabetes or be able to coach a patient on improving their blood pressure or eating a healthier diet," Southard says. "Just as social workers who are currently more involved in the physical health of patients need to understand mental health better. Overall, all of our subspecialties need to branch out and at least know the beginning steps of assisting a patient with an issue outside of their specialty." While the ACA presents many potential opportunities for social workers to expand their role in the health care system, there is work to be done. The technological and business changes that the field faces are significant. "There are a lot of changes to many systems as a result of the ACA and it's a lot to grapple with," Meikle says. "The social services field really hasn't had a big business process disruption in its history but it's possible the ACA could be it. But resisting these changes and the implementation of new technology is futile as that's where the future is headed. The ball is already rolling that way. It's now up to the field to take the necessary steps to keep up."